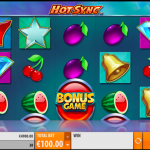 Hot Sync is a video slot game from Quickspin. This is a slot machine that is inspired by the very popular classic games but with modern makeover. The symbols are beautifully designed and they float around the reels that are placed on a blue and purple background. The sound effects are relaxing and they perfectly complement the theme. 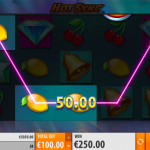 Hot Sync has couple of features that distinguish this game from the older classic slots. There are 3 special symbols, the wild which substitutes for every other symbol to complete a winning line, except for the Bonus and Hot Sync Wild symbols. Every time you land 2 or more Hot Sync wild symbols you will activate the respins feature. The reels that the wilds were on will become hot and they will contain more wild symbols during the respin. And that is not all, the reels will be identical when they stop spinning. Every new wild will continue the process. The main feature here is the free spins round. You need to land 3 scatter symbols on the second, third and the fourth reel to receive 8 free spins. When you land a Hot Sync Wild, the symbol will turn the given reel hot and it will remain that way until the feature lasts. 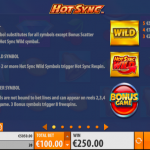 Hot Sync is a fast moving video slot game from Quickspin. The graphics are really nice, but what we appreciate the most is the fact that the game offers some features that we have not seen in other games. This makes the game unique and fun to play. The best part is that the respin feature is activated very easily so the whole experience seems like you are playing one big mini bonus game the whole time. Something different? For a great engaging slot you should consider playing Phoenix Sun a 5 reels slot by Quickspin.